Constipation is a painful problem for your pet. Talk to your vet about Lactulose, a prescription laxative used to treat constipation in dogs and cats. It works quickly to relieve the pain and frustration associated with constipation. Lactulose can also be used to treat and prevent a liver disease called portal-systemic encephalopathy. 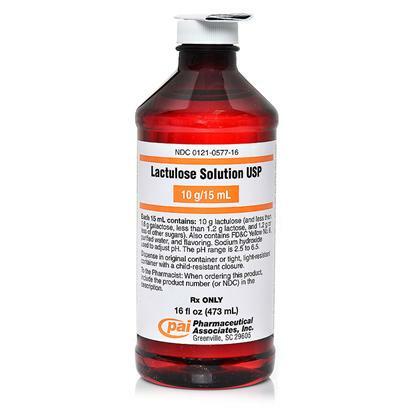 Laactulose Solution is the Generic Alternative to Generlac. Side effects of Lactulose include flatulence, bloated stomach, and cramping. Lactulose may alter the insulin requirement in diabetic animals. Use Lactulose with caution in animals with fluid or electrolyte imbalance. Contact your veterinarian if your pet is producing less than 2-3 soft stools per day or if the condition worsens. Diarrhea and dehydration are symptoms of overdose. Symptoms of an allergic reaction may include: facial swelling, vomiting, diarrhea, cold limbs, shock, seizures, pale gums, hives, scratching, or coma. Contact your veterinarian if your pet is exhibiting any of these symptoms. Tell your veterinarian if your pet is taking any other medications or supplements. Do not use this product with other laxatives. Oral antacids may reduce the effectiveness of Lactulose. Lactulose comes in liquid form and is administered orally. Be sure to follow the dosage instructions provided by your veterinarian. Many cats do not like the taste of Lactulose, and you should contact your veterinarian if you have difficulty administering the medication.